Tulsa Pride Parade, Saturday June1st, 2019, step-off time 6:00 PM. The Parade begins at 13th and Boston, goes North on Boston Avenue to 4th Street, and then East on 4th Street to the Tulsa Pride Celebration at the Dennis R. Neill Equality Center! The Tulsa Pride Parade’s arrival at the Dennis R Neill Equality Center kicks off our Celebration’s rocking evening of entertainment on the Main Stage. 1. Check in begins at 4:30 p.m. at 13th and Boston Avenue in the north parking lot. 2. Shuttles begin leaving from the Tulsa Pride Festival at 4:00 pm in front of the West Festival Gate area around the old Tulsa Fire Station at 4th and Frankfort. 3. 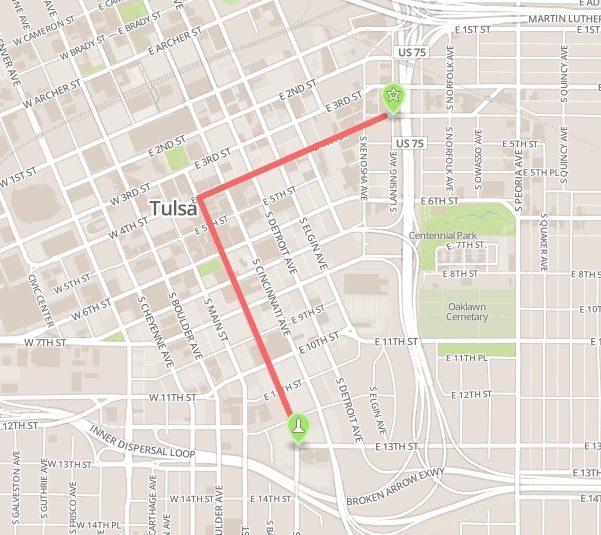 The Shuttles take you from the Tulsa Pride Festival to Parade staging area at 13th and Boston Avenue. The shuttle will continue to run till 30 minutes after the parade. 4. All parade entries must be paid prior to participation in the north parking lot. 5. All parade participants must be checked in by 5:30 p.m. in the north parking lot. 6. The Boston Avenue United Methodist Church hosts our Parade Staging Area. The church is open for restroom use and access to water fountains. Respect their space. 7. Please make sure to dispose of any trash and cigarette butts and water bottles and pop cans in designated trash bins in the parade staging area. 8. No liquor or adult beverages are allowed to be consumed in parade staging area or while participating in the parade or along the parade route. Oklahoma ordinances do not permit open containers of adult beverages. 9. Parade steps off promptly at 6:00 p.m. with LGBTQ Veterans leading the parade. 10. All vehicular entries are subject to the traffic laws of the State of Oklahoma and the City of Tulsa and must have a current proof of insurance and the driver must have a current state issued license. 11. All bags, boxes, and totes are subject to inspection; please cooperate with our Tulsa Police Department and Tulsa Pride Security Team. 12. NO weapons are permitted in the Tulsa Pride Festival grounds. 13. Parade Entry Participants will provide all necessary supplies to operate their parade entry safely. 14. Parade Entry Participants agree to comply with all instructions from The Tulsa Police Department and the Tulsa Pride Staff. 16. Parade Entry Participants should be checked in and ready to participate at the designated place and on time on Saturday, June 2nd in the north parking lot. 17. Parade Check-in is at 13th and Boston Avenue under the shade trees on the north parking lot directly across from Boston Avenue United Methodist Church. 18. Walking contingents line up on 13th Street. Your vehicles can park in the east parking lot and the south parking lot. NO vehicles in the north parking lot. 20. Vehicles, and cars and mid-size trucks assemble on the west parking lot across from Boston Avenue United Methodist Church. NO vehicles on the north parking lot. 21. If a walking contingent accompanies a vehicle or float they need to wait for that vehicle to enter the parade route before stepping off. They wait for the vehicle or float to march. 22. You will encounter protestors. DO NOT ENGAGE THEM!!!!! IGNORE THEM PLEASE!!! !